The contact lens industry has recently seen a new competitor introduced to the market. Like DollarShaveClub.com a new service is looking to implement the same subscription formula for contact lenses. SightBox and Hubble Contacts are two online contact lens retailers offering to sell contact lenses on a monthly subscription basis. Although both of these online retailers provide you with a vision correction option on a monthly subscription basis, they use different models to deliver the service. So What is the difference between the two and how do they measure up against more traditional methods? Let's take a snapshot of the three retail channels available online and compare their strengths and weaknesses in order to determine which service could work best for you. To begin with, let's look at each of the online retail service types to gain a better understanding of each and how they position themselves as a provider. Hubble Contacts: Hubble contacts offers private branded daily disposable contact lenses for a monthly subscription fee of $30. According to their website, the basic requirement to join and use the service is a valid contact lens prescription issued for their brand and proprietary product parameters (8.6 base curve and 14.2 diameter). This is a legal requirement as stipulated by Federal law. The eye doctor's contact information as well as any specific recommendation for use is also required. This may include the validity of the prescription as well as the number of boxes that are permitted for purchase during the period of validity. SightBox.com: SightBox is a service that commits to offering a complete contact lens service that includes scheduling appointments with an eye doctor, paying for the exam and the contact lens fitting, and receiving the valid contact lens prescription. Once in possession of such prescription, they will fulfill an order for the delivery of a year supply of contact lenses to you. Similar to Hubble Contacts, in order to benefit from this service you must commit to a minimum monthly subscription fee of $39 per month. Traditional Method: Currently, customers of major leading online retailers of contact lenses are accustomed to seeing their eye doctor on a regular basis so that they can ensure that their contact lens prescription is the correct one for their vision needs and that of their overall eye health. Once they are provided their valid contact lens prescription they are free to choose their retailer. This could include their eye doctor's office or a variety of reputable and well known online providers who sell the major brands on the market today. Now that we have a basic overview of the three major service channels available on the market today lets dive a little deeper and compare each of them on a more granular level. Contact Lenses are considered a medical device and must be fitted and prescribed by a licensed contact lens fitter or eye doctor. Normally speaking that means that you must be fitted with Hubble Contacts and provided a valid contact lens prescription detailing the lens measurements specific to that lens. Once you have such a prescription you can place your order with Hubble Contacts. As a convenience this vendor appears to have a network of eye doctors and/or contact lens fitters to recommend customers to. These can become the source of the contact lens prescription for the brand. Article 3 of The Fairness to Contact Lens Consumer Act of 2004 stipulates that a valid contact lens prescription must contain the specific lens measurements and brand that the eye doctor and/or contact lens fitter has prescribed to the patient. A brand equivalent can be permitted if the lens brand selected for the patient has a private label brand equivalent or vice versa. The act does not provide for a unilateral replacement option for the prescribed brand unless it is fitted and then approved by the eye doctor. So in principle, and according to the writer's understanding of the Act, only once you obtain a valid contact lens prescription for Hubble Contacts or the eye doctor's specific instruction to use such a lens in replacement of your regularly prescribed lenses can Hubble Contacts become a viable option. The SightBox.com service offering extends to include scheduling and paying for an eye exam and a contact lens fitting for a major brand. This service may save you time but commits you to a set purchase schedule for a year's supply. Traditional online contact lens retailers are focused on providing you with a complete product offering from the major manufacturers, delivered on a timely basis with excellent customer service. In compliance with Federal law, the traditional retail option requires that prescription verification is completed prior to the processing of your order. Once equipped with a valid contact lens prescription some online retailers provide website tools that allow for the automatic reordering of your contact lenses on a scheduled basis so that you don't ever have to go without your contacts. Hubble Contacts charges approximately $30/month, which they claim to be half the price of the leading brands. Although there is some truth to this statement it is somewhat misleading. According to Contact Lens King's Blog article "Hubble Contacts: 4 Things to Consider Before Purchasing", there are multiple brands of daily disposable contact lenses that are as much as 28% less expensive than Hubble Contacts' product line. SightBox.com's price is as low as $39.00/month. However this figure is dependent upon the type of lenses and the frequency of wear. In the case of this service it is important to note that the price being billed includes the cost of the eye exam. Although, if viewed on an overall basis, this service seems affordable in comparison to purchasing from eye doctor's office. However if the consumer purchases from an online retailer, the consumer can realize significant savings, perhaps even up to 70%. For instance, highly credible and well-rated online retailers can provide an annual supply of Acuvue 2 contact lenses between $100.00 and $150.00. Even with the cost of an eye exam, which AllAboutVision.com averages as low as $50.00, places SightBox at twice the price or more. However, if your contact lens prescription requires the purchase of astigmatism lenses such as the Frequency 55 Toric XR or Dailies Aquacomfort Plust Toric, SightBox might be the best choice. The cost of using traditional contact lens retailers such as your eye doctor or online contact lens retailers can vary dramatically. Using online contact lens retailers can save you up to 70% your eye doctor's regular pricing. In contrast, online retailers are priced much more aggressively than Hubble Contacts and SightBox. Hubble Contacts' private label contact lenses are manufactured of methafilcon A. Although this material has been used in the manufacturing of contact lenses for decades as a proven material, it is considered to be an earlier generation material first launched in the 1980's. Methafilcon A belongs to a group of lens materials commonly called HEMA Group 4 within the industry. This group includes a variety of other lens material brands however their overall oxygen transmissibility range is between 15-28 Dk. In the late 1990's and early 2000's Silicone Hydrogels were introduced into the market with oxygen transmissibility ranges between 60-140 Dk. Although the values don't mean much to the lay person they describe a measurement of the oxygen reaching the cornea and its surrounding tissues. When comparing values you can see that the new materials' measurement is several times that of the earlier materials such as Methafilcon A. These newer materials, commonly used by the major manufacturers, are specifically designed to provide maximum oxygen delivery to the cornea such that the wearer's eye health can be maintained during all-day wear. Additional technology was introduced into silicone hydrogel materials in the past decade specifically focused on increasing wearer comfort for all-day wear and avoiding end-of-day drying, discomfort or itching. According to Contact Lens Spectrum, "The eye has the greatest likelihood of good health if it receives the highest possible levels of oxygen. ", and The National Institute of Health (nih.gov) states "corneal swelling of the lens wearing eyes are consistent with the differences in oxygen transmission". The higher the oxygen transmissibility the higher likelihood of healthier eyes. 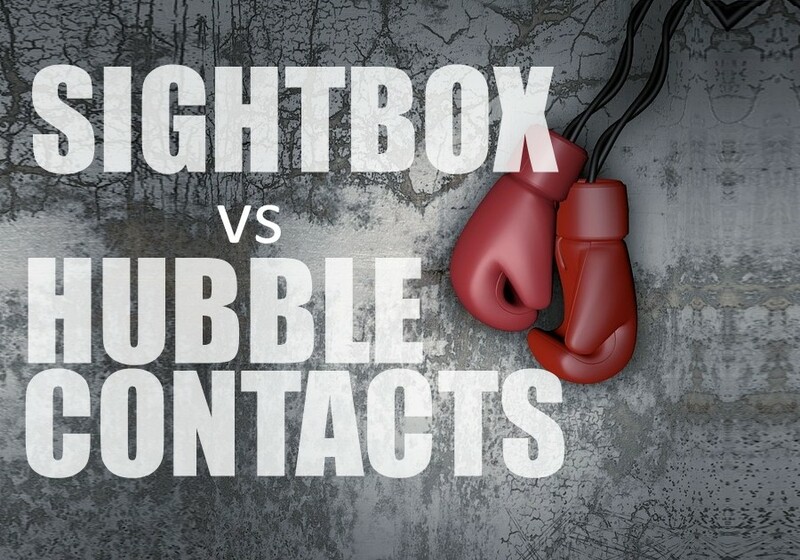 SightBox provides known and credible contact lens brands ranging from Acuvue, Air Optix and Biofinity. By providing branded lenses SightBox accommodates for the best possible products that the eye doctor recommends based on eye type and vision requirements. Similar to SightBox, traditional online retailers provide patients with branded products that best fit their individual needs, as recommended by their eye doctor. Unless you carefully manage your contact lens supply by cancelling and re-upping of your subscription on a need-to basis, Hubble Contacts' subscription model is designed to deliver the ideal quantity of lenses based on the prescribed wear regimen recommended by your eye doctor. As a subscribed customer you will continue to receive your set monthly contact lens order with a cancellation option allowing for a subsequent re-up of your subscription based on your needs. What does this mean on a practical basis? If you do not properly track your lens supply and have days when you might forgo wearing your contact lenses for whatever reason, you will begin to accumulate extra lenses. SightBox, similar to Hubble Contacts, requires you to commit for a year restricting your flexibilty for increased convenience. The traditional method of ordering from online retailers provides competitive advantages, such as flexibility to choose how many weeks/months and the amount of money you want to commit to a specific product or provider. After reviewing the above material; when comparing shear flexibility, product quality and overall cost savings, traditional online retailers provide the best value. For convenience and product quality SightBox comes in second. Hubble Contacts fall short in many aspects such as cost, flexibility and product quality placing them in third place amongst all the choices. Before committing to a provider find out what is important to you; for example, is it cost, flexibility or convenience. If high quality branded products and being fiscally responsible are the predominant factors than online retailers would be the best avenue, however if convenience is the determining factor perhaps SightBox would be the best option.